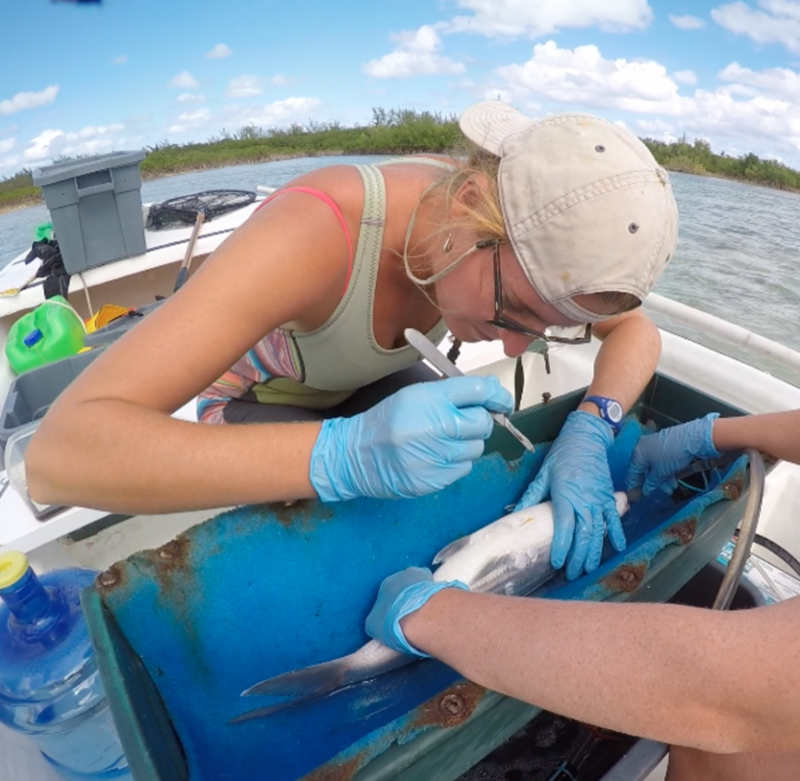 Last year, CEI’s Flats program, along with Georgiana Burruss, CEI Research Assistant, began a three-year study to identify critical bonefish spawning aggregation sites on Eleuthera, The Bahamas. Currently, six spawning aggregation locations have been identified in The Bahamas; one of which is located in South Eleuthera. This study aims to track bonefish populations across Eleuthera to fill this knowledge gap and identify critical habitat for this economically important species. 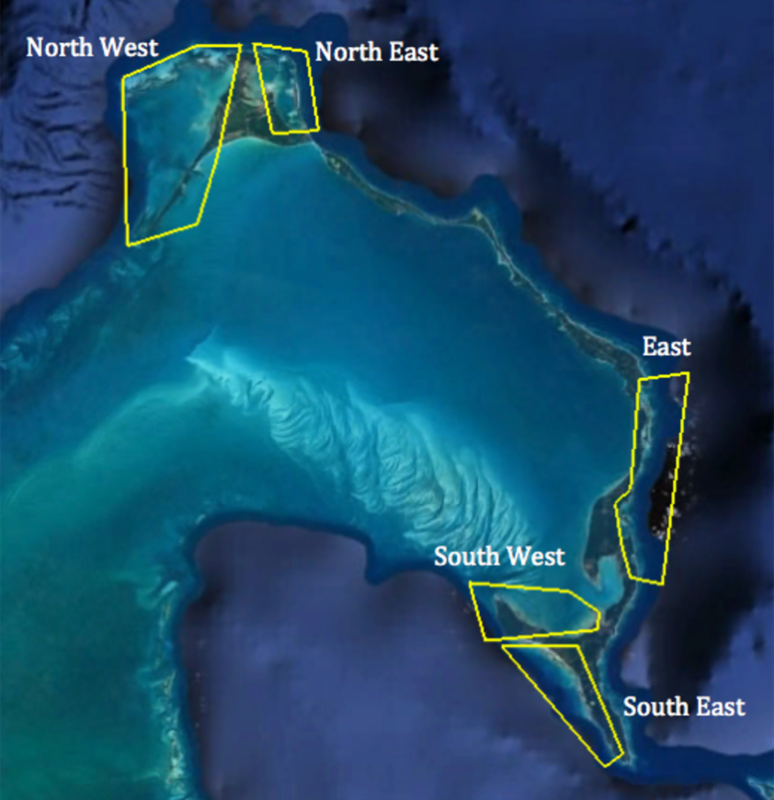 In year one, the team identified a number of potential bonefish spawning migration corridors in North Eleuthera, South Eleuthera, and along the East coast of Eleuthera. The team deployed 62 VEMCO acoustic receivers to track the movements of 39 tagged fish as they migrated away from known foraging grounds and tidal creeks. Bio-telemetry data indicated potential spawning migration corridors in the North East, South East, and East regions of Eleuthera. In addition, the team was able to track the nighttime movements of spawning aggregations in the South West region of the island. Although, transmitter detections in the North West part of the island were limited, data suggests this may be a result of timing coordinated with spawning-related movements in other regions, indicating that the detections were potentially spawning-related. Interestingly, bonefish tagged in each of the areas were not detected in another region, suggesting these populations are unlikely to mix. Overall, 5 migration corridors have been identified, with data suggesting that there are at least 5 bonefish spawning sites on Eleuthera, although further studies are needed. Where are bonefish forming spawning aggregations in the 5 regions of interest on Eleuthera? How do abiotic factors (season, moon phase, temperature, current, tide, etc.) influence bonefish spawning migrations in South Eleuthera? What is the energetic cost of spawning migrations? How do predators interact with the bonefish spawning aggregation? Two VEMCO positioning arrays were deployed to assess the broad and fine scale spawning migration movements of bonefish in Eleuthera. 42 receivers in the broad scale array were concentrated around zones of interest in each region (identified from last year’s study) to further the understanding of bonefish spawning migrations and staging areas. This increase in coverage combined with manual tracking and visual observations should provide further evidence and confirm our previously identified sites of interests as critical spawning areas. Transmitters will be implanted in 30 bonefish at strategic locations around Eleuthera allowing for the fine scale movements of these fish to be collected. Additionally, these fish will add to the existing 39 bonefish tagged last year to provide unprecedented data on these economically important species. By simultaneously tracking bonefish from several areas of Eleuthera, we can better determine which environmental cues bonefish use to form spawning aggregations, such as moon phase and tides. VEMCO receivers are attached to cinder blocks with rebar posts. This receiver has a SYNC tag positioned above it, allowing for triangulation of position with other nearby receivers and allowing for the fine scale movement of bonefish to be assessed. 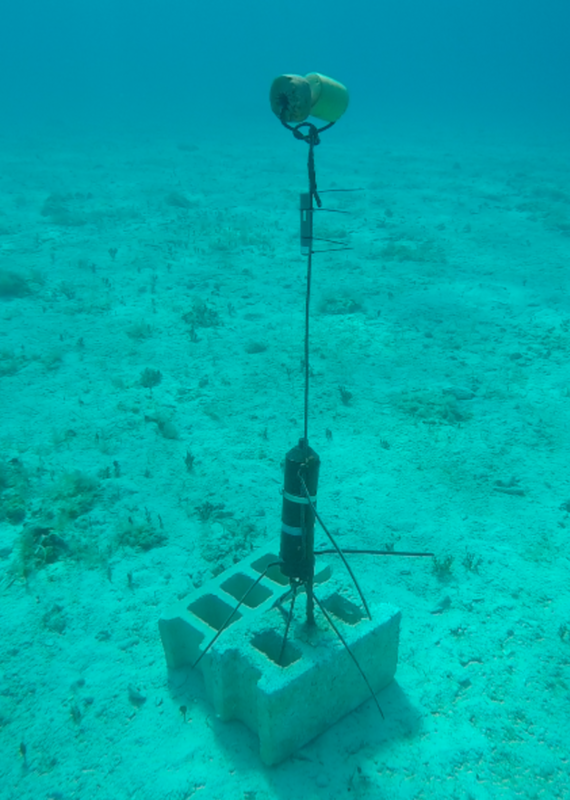 At the previously identified spawning aggregation site of interest in South Eleuthera, 31 receivers were placed in an overlapping fine-scale array to track the movements of the bonefish aggregation on an almost continuous basis. This array will allow the team to answer questions related to: how abiotic factors (current, moon phase, seasonality, tide) influence bonefish spawning, how predators interact with the aggregation, understanding the energy expenditure of bonefish when migrating to their spawning site, and potentially the physical act of spawning which is yet to be described. Furthermore, the fine-scale array will fill critical knowledge gaps regarding the diel movements of tagged predatory species, such as great barracuda,Sphyraena barracuda, and blacktip shark, Carcharhinus limbatus. In addition to the basic positional transmitters being deployed, the team will be deploying 20 acoustic transmitters fitted with accelerometer sensors to determine energy expenditure of bonefish during spawning as well as 20 acoustic tags in predatory species to assess predator interactions with the bonefish spawning aggregation. Collectively, findings from this study will be used to develop a management and conservation framework for bonefish and predatory species of surrounding Eleuthera, The Bahamas. Georgiana Burruss makes an incision for internal implantation of an acoustic tag in a bonefish captured at Half Sound. 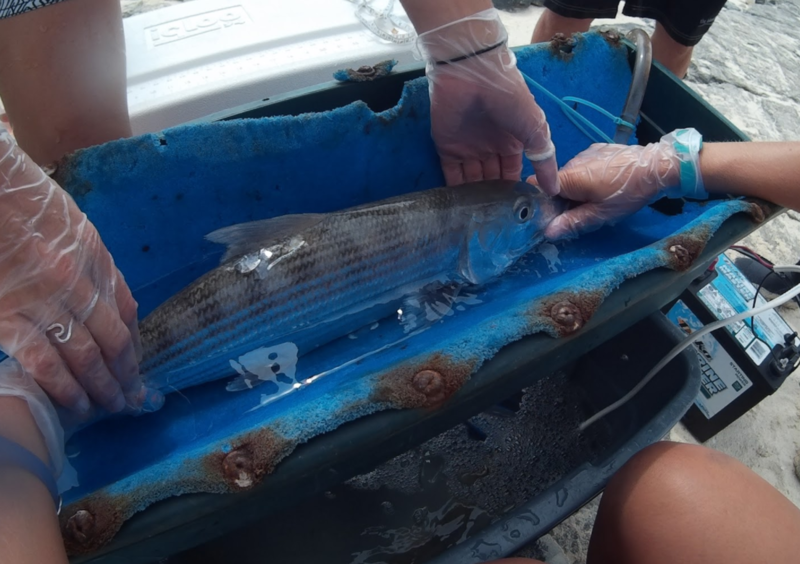 A bonefish recently implanted with an internal acoustic tag also receives an external spaghetti tag in order to identify it in the event that this fish is recaptured. This project is being conducted in partnership with Fisheries Conservation Foundation (FCF) and funded by the Hutchins Family Foundation. Georgiana Burruss is conducting this study as a MSc. thesis at Michigan State University. This year, the team is supported by visiting researchers from FCF, Illinois Natural History Survey, Florida Institute of Technology, and Florida Fish and Wildlife Conservation Commission. Cocoloba Tours, Fishbone Tours, and the Rainbow Inn have provided support in the form of lodging and guiding. For more information regarding this project, please contact Georgiana Burruss (georgianaburruss@islandschool.org).